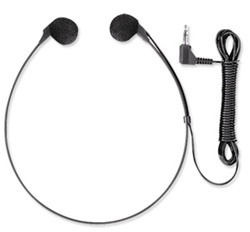 The Olympus E102 (141567) stereo headset for your PC. Its extra long cable connects to your computer’s soundcard (3.5 mm plug) making it a helpful tool for PC based transcription in busy environments. The E102 is supplied in the AS-2400 transcription kit and is also available separately as spare part.